It's one of Kazakhstan's big cultural calling cards - the noble hunter with the eagle on his arm. Many people have seen it on BBC or read about it somewhere when they were kids, and when they get to Almaty, they're a bit bummed that falconers aren't found on ever street corner. You can find entrepreneurial men offering eagle photos at tourist sites, but real eagle hunters are hard to find. I know, because I spent years of my life doing research for something I called the Central Asian Falconry Project. Now my obsession has shifted from birds to brickwork, but I thought Walking Almaty readers might appreciate this one sub-project I worked on last year, a guide to falconry-related sites in Almaty. Even if you can't find a living, breathing eagle man in the city, at least you can find the cultural artifacts that this ancient tradition has left behind. It is only sensible to begin our guide with the Altyn Adam, or Golden Man, an icon of Almaty in its central square. 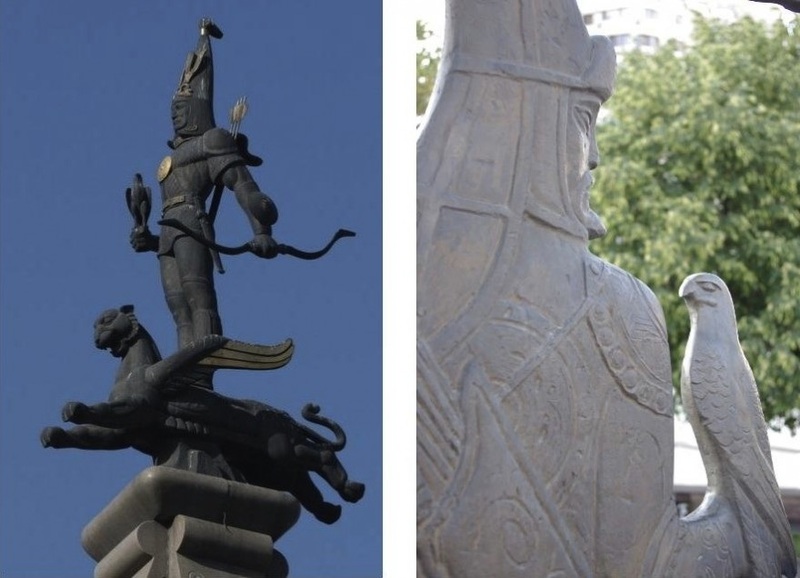 The statue is devoted to a Scythian warrier whose burial mound was excavated in a town outside of Almaty in 1970. Found on accident while planning a parking lot, the mound turned out to contain some of the best-preserved gold armor ever found (it had until then gone mysteriously unraided). The “Golden Man” became a symbol of nomadism’s past glories, and in 1996 a monument to the hero was erected in the Square of the Republic. The sculpture, designed by Shoti Walikhanov, is a fanciful interpetation – the Scythian is shown riding a flying snow leopard like a surfboard, a falcon perched on his fist. Who decided that the Golden Man was a falconer? I posed this question when I visited the Golden Man Museum at the excavation site, and the confident tour guide responded that a hunting eagle had been discovered in another burial site in Mangyshlak, Western Kazakhstan. “Okay, then why did they give him a falcon and not an eagle?” I nitpicked. “That’s a question for the sculptor!” said the guide. Below the stela that lifts the falconer sculpture to the sky is a semi-circle of bronze, with several panels showing Kazakh history from its earliest Scythian roots to the trials of Russian colonialism and independence. On one panel is an archer, again with a falcon on hand. What do these artists have against eagles? Too big too carve? The Auezov Theater metro station nearby is a goldmine of falconry art. At the end of the hall where passengers wait for their trains, there’s a large mosaic, titled “Atamura” or “Heritage”, that was modeled off a mosaic you can find aboveground on the Soviet-era Wedding Palace nearby. It features a Kazakh wedding party or betashar, and it’s full of corny depictions of “traditional” Kazakh costume and accessories. Therefore a falconer is in presence, his bird presumably there to officiate. 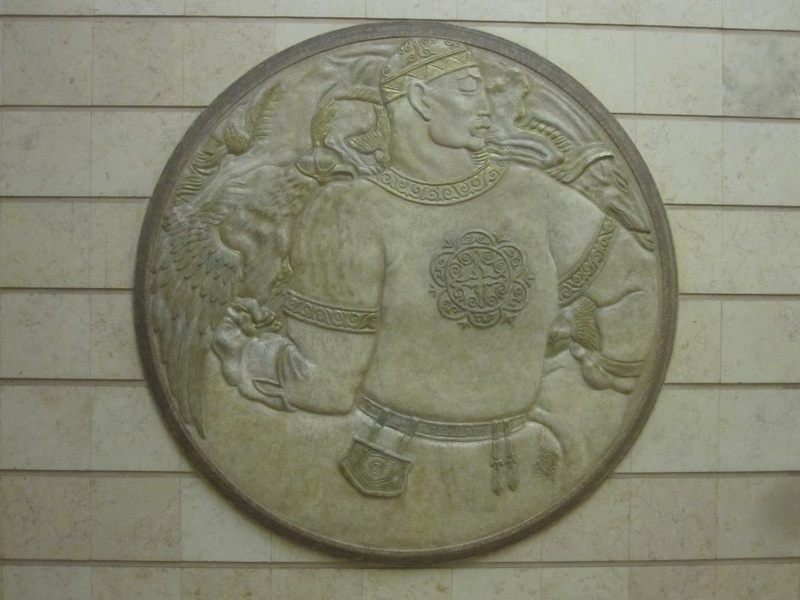 Along the hall itself are 16 circular bas-reliefs, made of plaster of paris, each one depicting a different scene from traditional Kazakh life. One shows kok par, or goat-carcass polo. Another shows horseback wrestling. Falconry birds appear in several scenes, especially prominently in one large panel that shows a man sitting cross-legged with his eagle. The Zhibek Zholy metro station also has some falconers, but they’re not as conspicuous. 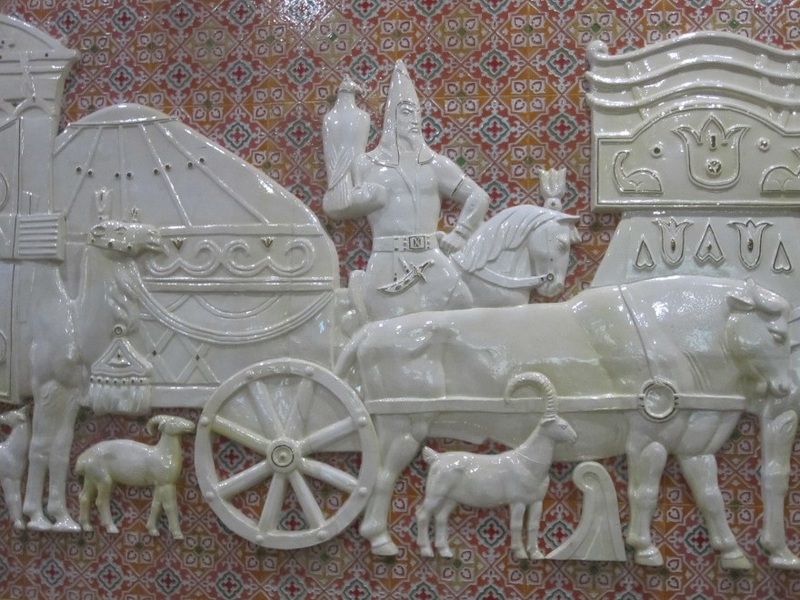 The wall opposite the ticket window is decorated with a scene in glazed porcelain, its whiteness (ak in Kazakh) representing the purity and sacredness of the Kazakh people. There’s a caravan, representing the Silk Road that once ran through Kazakhstan (the name of the station, Zhibek Zholy, is the Kazakh phrase for that ancient trade route). In the caravan, you can spot a falconer. 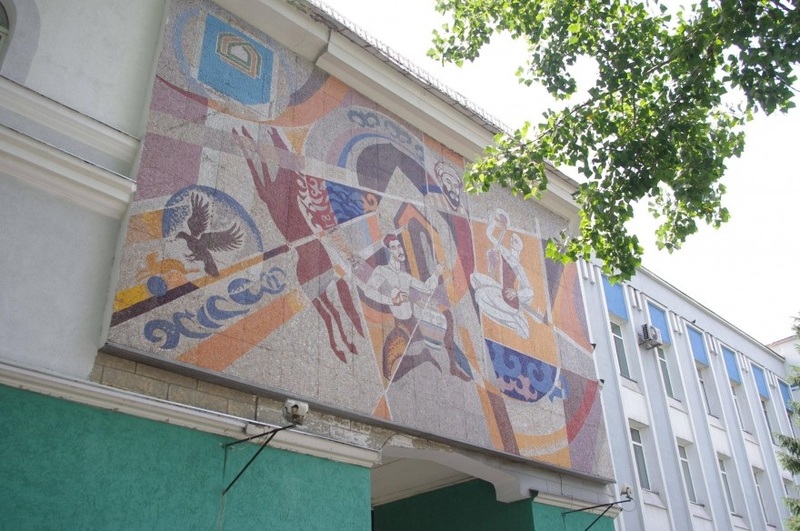 A bit further into the station, above the escalators, is a composition titled “The Great Steppe and the City.” The right-side panel features images of masculine Kazakh life, like caring for horses and training eagles. Kazakhstan’s most prestigious university is perhaps KIMEP, the Kazakhstan Institute for Management, Economics, and Strategic Research. It’s building was formerly the trade school for aspiring party members, and it was presumably during this incarnation that a mosaic, pieced together with colored glass called smalta, was installed over an arch on Prospekt Abaya. In this work, the falconer himself is not glorified but the hunt itself. Only the very moment of predation is shown in the bottom-left corner, an eagle poised to take a fox. Soviet buildings have gotten a reputation for drab conformity, but at least in Almaty they are frequently adorned with charming carvings and mosaics. In the west of Almaty there are these kinds of commie suburbs, the mikroraions, grids of pre-fab apartment blocks arranged in self-contained community units. Here one can find some of the neatest facades. 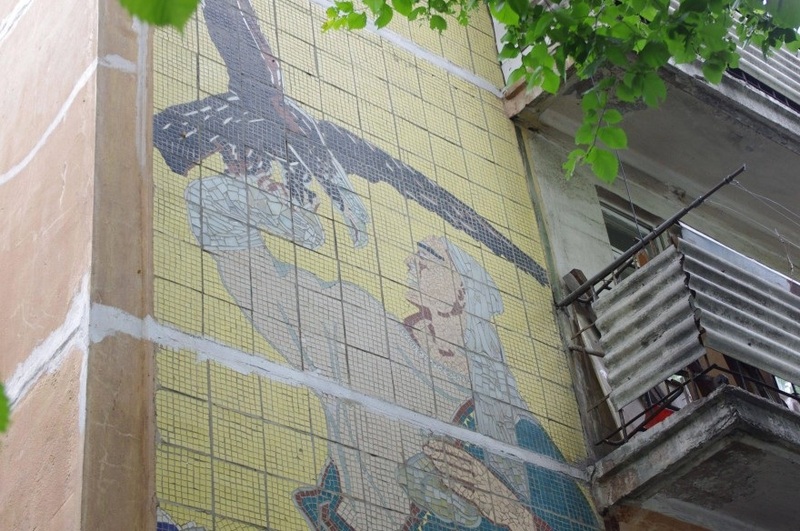 At 11 Shalyapina between Beregovo and Sain, the three-story building sports a mosaic of a falconer, shaped out of glossy colored ceramic. He’s sporting a do-rag, which has inexplicably become a part of the ancient Kazakh’s imagined wardrobe. Another work of falconry-related "monumental art" was only just revealed in the summer of 2015, when an advertising banner for an Italian shoe company was taken down to reveal an eagle hunter underneath. 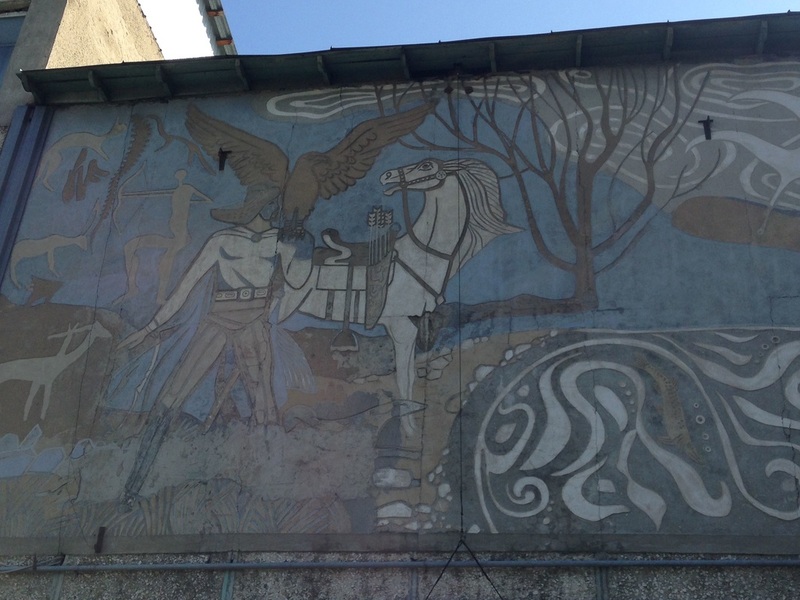 The large art piece is done using a plasterwork technique called sgraffito and can be found on the former site of the Soviet Research Institute of Hunting and Fur-Farming - hence the falconry theme. These days only a small hunting store suggests the building's former purpose. The Hotel Alatau was once the crowning jewel of Intourist, the Soviet Union’s infamous hospitality department, but it has since been nearly forgotten as the Marriots and Best Westerns have come to town. The Marriot may have a gorgeous glass skyscraper and a glamorous reputation, but the Hotel Alatau, with its sculptural ensemble out front, at least has a sense of place. 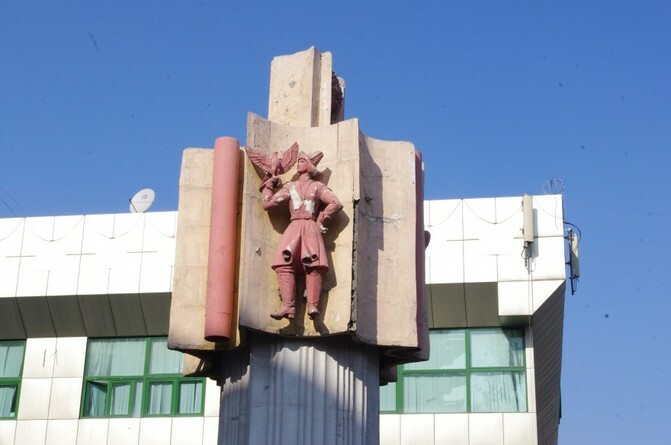 The statues there were designed in 1975 by Viktor Innokentovich Konstantinov, the same “monumental artist” who worked on the better-known Arman Cinema down the street. The Alma-Arasan gorge in the mountains south of Almaty hosts the Sunkar Falcon Center, the only place to see professional bird handling in the city (yes, there are some sad-looking hawks at the zoo, and various amateurs selling eagle photo-ops at the parks, but those are best ignored). 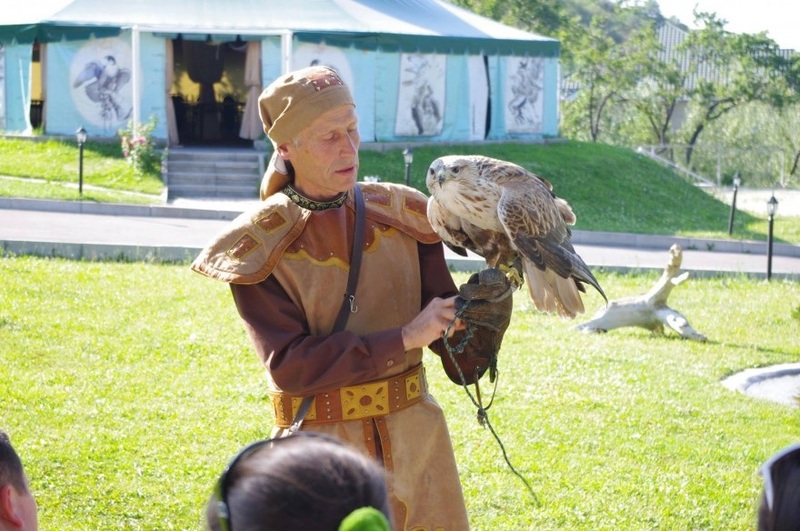 The place is a must-see if only for Pavel Pfander, the Kazakhstani German who trains the birds of prey there and puts on a highly-entertaining and educational show. I met “Uncle Pasha” at the IAF meet in Qatar and can confirm his credentials as an ornithologist and respected falconer. It was a nice coincidence that I spotted a falconry bus stop on my way to visit a falconer. My friend and I were driving to visit the hunting legend Abylkhak-Ata at his home outside of Almaty when we cruised past this relic of a Soviet-era regional bus network. “Stop the car!” I shouted. 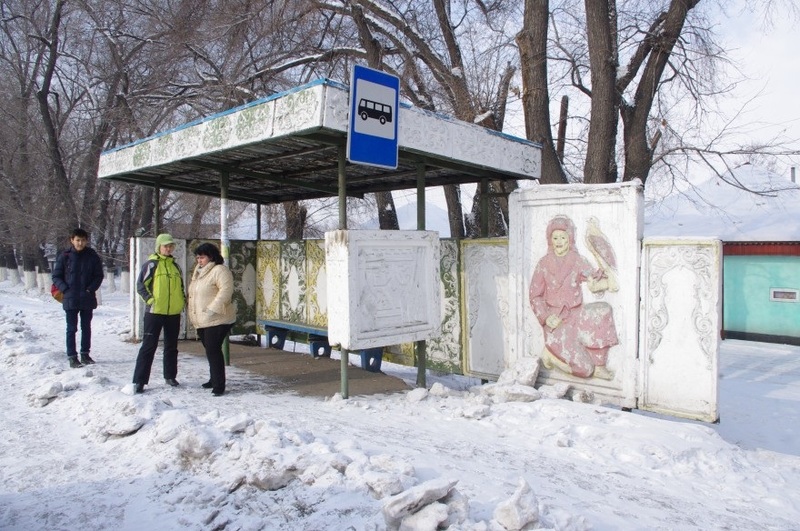 The bus stop is similar to many in the area, made of form-molded concrete slabs that have been painted rather crudely with cheap paint. This falconer has been especially disrespected. The red paint on his lips was laid on so thick that the noble hunter seems to be wearing lipstick.